How to get your project started - Universal Landscape, Inc.
From small project cleanups and plantings to full property layouts and landscape designs. 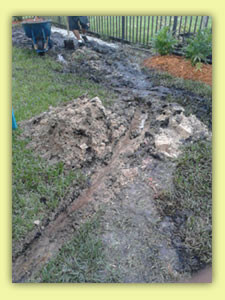 Universal Landscape, Inc. provides a wide range of services to enhance your property. Whether you are calling for a small project or large, if you’ve collected photos from magazines of what you may like or are looking for ideas, after over 20 years in the business one thing is certain, we can make any property look great in many different ways – and we are never short on creativity. If your project involves landscaping, waterfalls, rockscapes, pools, patios, gazebos, driveways or problem areas down to drainage, irrigation or grading issues, we will evaluate your property needs in a FREE CONSULTATION. For Any Project In our first visit to your property we will be able to assess whether the project you are considering can receive a price from us on the spot, if a plan may be desired or if we may need a couple of days to work up a price. No matter what size or what outdoor project you are considering, our goal is the same, to provide you great value at competitive pricing, while delivering excellence in our service and work. Not all of our projects require plans, but for the many that do, our initial task is to listen. We aim to exceed expectations in many projects we do, and by paying close attention to your needs, how you may plan to use different areas, the atmosphere you may wish to create and a budget you are comfortable with, is the beginning of any plan. In our portfolios we bring examples of many different projects we have done, which greatly help our customers for any project, large or small that we design. We also can present hundreds of different photos, categorized for easy viewing, of many different varieties of plants, trees and tropical palms we have used both young and mature, of hardy species to work with. Viewing these photos helps us both determine exactly what varieties, styles and color shades you like, even if you don’t know about plants or trees, or weren’t sure what you liked when we first arrived. We approach designing as an art form that serves both function and beauty. If you are interested in a property layout, landscape work or waterfalls, the design begins with determining the look and ambience you wish to create for an area or an entire property. How the area is laid out for use is as important as the leaf styles, the textures of materials and color shades, all help to assemble the first look and feel of the custom design we are creating. For some we are sought after to help create landscapes and gardens that help satisfy many different senses. That includes the ambience of sounds, the fragrance of some flowers like Gardenias and Jasmine, and the taste of fruits or building a new vegetable garden when desired and able. Some call for us to plan around their lifestyles that allow for use for family and friend gatherings, establishing framed open views or stunning resort style settings. Others may call for a shaded tree canopy area to enjoy the outdoors and for some a quiet, retreat area to relax and unwind with a table seating area or hammock. These spots can add a dimension to the complete feel of a home that no indoor room could provide. (That’s not counting the scenes we create for the view you see from inside your windows, that are a very visual part of your rooms ambience. People have many different needs, styles they like, shapes and sizes of properties and our job is to tailor our designs to each individual customer and their own specific tastes and needs. The price of a plan for most residential homes is typically $200, payable as a deposit for us to begin the work on it. At this time we also require a SURVEY or SITE PLAN that illustrates the dimensions of the property and the measurements of how your home (or building) sits on it. It typically takes about 1 – 2 weeks before we will be able to present you the plan – a 24″ x 36″ layout – often with different pricing options (if desired) – in a second meeting review. At that time – we both will have a copy and will literally be working from the same page – and with the budget range we first discussed that you are comfortable with. The design is the first important factor in our opinion – and if changes are desired – there is NO CHARGE – as this is a great way to get a feel for the project before it is begun – and a good time to make changes if there are any. We would like to give plans away if we could. 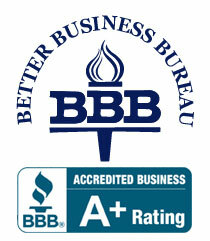 They help us to ensure of delivering a job that will make our customer’s glad they chose us. And in fact – for the customer’s that do hire us to create their project – the PLAN IS FREE. When going over the plan and pricing – when a deposit is given to us to schedule a start date – the price of the plan is deducted directly from the cost of the job. In short, the plan fee is not money spent on just a plan – it becomes a payment directly towards the cost of the job. 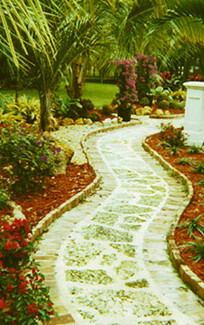 Once we have in place the overall plan and idea of the way you wish your property to look and feel, we often will break down property landscape plans into sections, and even offer different pricing options for different work or material sizes to provide more pricing choices to best help meet the budget a customer may have. Even if the project you are considering is a single project area – often we can offer different prices on the same design, with adjustments in the scale of a project or options on the materials (or sizes) involved. Estimate or Plans reviewed, contract signed, estimated time to perform the job outlined, estimated start date noted, deposit given – and if materials being set up and staged – all areas marked. If it’s a small project – a clean up or small planting, etc. – many are done in a day or so and don’t require very much coordination. We call to let you know how we’re doing ahead of time with the start date – call the Line Location Service to mark all underground utilities (Free Service) and show up to do the work for you. Some live in associations that need sketches and other information – some don’t. If you do – this is included as part of our service. Some projects may involve working with other trades – contractors you’ve hired or like – or others that we may have suggested that we have experience with. We can facilitate your schedule – in the role you may need us to in different projects – to help everyone to work together as a team. (Electric, Concrete, Fence, Pool builders, General Contractors, etc. Awards, Home of the Month and Magazine recognition that we and some customer’s receive all stem from a simple philosophy we hold in the approach to each job. In short, we seek excellence in our profession and trade, always looking at how to perform better, how to incorporate green industry water & energy designs in our work when called upon and how we can do our best in every job we perform. So, if you’re thinking about that project and looking for a good price and great work and want to find out what we can do to help, give us a call today, we’ll work hard to make you glad you did !